The chorus was founded by then Temple Emanuel Rabbi Frank Muller in the fall of 1994. Rabbi Muller recruited singers from both Temple Emanuel (Reform) and Beth Israel Synagogue (Conservative). Our original repertoire consisted of unison singing and simple rounds accompanied by guitar. In an effort to establish a name for our group prior to our first performance (Hanukkah dinner of '94), the Rabbi jokingly coined the term "Chailites" and the name stuck. Under Rabbi Muller's energetic leadership the Chailites participated in their first High Holy Day service within the first year. With the departure of Rabbi Muller in late '95, member singer Andy Friedman assumed leadership. Soon thereafter, in consultation with Cantor Emeritus Allen Levin, a standard Shabbat service repertoire was developed and sung on a monthly basis. Thanks to the encouragement of the Temple Emanuel Board and the congregants as a whole, the Chailites helped bridge the time gap between Rabbis. The Temple Emanuel Chorus (aka "The Chailites") exists to enrich and enhance the religious/cultural/historical experience of the congregation through Jewish song with and without instrumental accompaniment and, on occasion, with instruments alone. Want to join? If you love Jewish music, have a basic understanding of written music, and can commit to volunteering about 6-10 hours per month during the school year, please write us for information about auditioning. If you would like to learn some of our songs click on our Chailites music link! Since the arrival of our current Rabbi, Kathy Cohen, in spring of '96 – along with continued support from the Board – the chorus has become an integral part of Temple life. 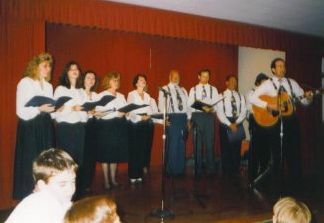 Through the efforts of director Andy Friedman and the dedication of the singers, the repertoire of the chorus evolved to mixed a capella choral singing, highlighted by appearances at Roanoke's Local Colors (a multi-cultural celebration) in spring of '97 and '98, as well as performances of classic High Holy Day choral repertoire. In the fall of '98 the chorus took a major role in an innovative musical approach to the High Holy Day services which drew upon congregational talent for soloists and utilized music spanning the ages. During the summer of '99, through the generous support of the Temple Board and the local Jewish community at large, the chorus again broke new ground by being the first representatives of SW Virginia to attend the North American Jewish Choral Festival. In December of '99 the chorus performed music for a PBS video focusing on Hanukkah which was broadcast regionally. In the new millennium, The addition of a digital piano to the Sanctuary in 2007 has broadened the choir’s musical palette. With the retirement in October 2009 of Andy Friedman from his duties as choir director, after 15 years of service, the Chailites entered a new phase. The Chailites are fortunate to have had Michael Cohen as their conductor for a number of years. The Chailites have also benefited from rehearsals with visiting cantorial students. Currently, Temple Emanuel is honored to have Scott Williamson as its Musical Director. He is the former General and Artistic Director of Opera Roanoke and an internationally acclaimed soloist. Dr. Williamson directs the Chailites, performs frequently as a cantorial soloist, serves as musical director for Temple Emanuel’s annual Purim spiel and has recently begun a children’s choir at the Temple. Incidentally, Dr. Williamson is also the Temple’s Program Director. Under his leadership, members of the Chailites recently joined with choir members of other Virginia Jewish congregations to perform at the Virginia Jewish Chorale event. Those attending our monthly Shabbat performances can look forward to the introduction of new music from our expanding repertoire as well as old favorites. Along with the Chailites, our music at Temple Emanuel includes cantorial soloists at Shabbat and High Holy Day services – even our very own Klezmer band at Simchat Torah. Learn More.